Northrop & Johnson participated in the 2016 Phuket International Boat Show, kicking off the 2016 boat show season. Northrop & Johnson announces a new Strategic Global Partnership with bespoke piano firm Goldfinch. Northrop & Johnson welcomes Rosana Williamson as PA to CEO and COO. She will be based in Fort Lauderdale. Northrop & Johnson announces the sale of the 98-foot MCP Yachts motor yacht EAGLE’S NEST. The 150-foot (45.73m) superyacht IONIAN PRINCESS is now for sale with Northrop & Johnson. Northrop & Johnson announces the $1,000,000 price reduction of the 150-foot (45.74m) superyacht ONENESS. The AAA Four Diamond Award® winning hotel features 750 guest rooms, including 45 spacious suites. Catch the light with the latest edition to Boucheron’s latest Quatre collection: the new Quatre Radiant in rose gold. Fly into the future with the safe and eco-friendly Ehang 184 AAV — a low-altitude autonomous aerial vehicle. The 151-foot (46m) luxury Delta superyacht KATYA is now available for charter through Northrop & Johnson. Make the most of 2016. Book a charter on the 157-foot COCKTAILS at the reduced rate of $150,000 per week. The 197-foot (60.05m) superyacht DREAM offers a Caribbean rate reduction from $425,000 to $400,000. The South Pacific’s premier superyacht regatta will take place from January 27 to 29, 2016. The sixth edition of the Superyacht Challenge Antigua is set to take place from January 28 to 31, 2016. Ao Po Grand Marina will host the inaugural Thailand Yacht Show from February 11 to 14, 2016. Welcome to the New Year! 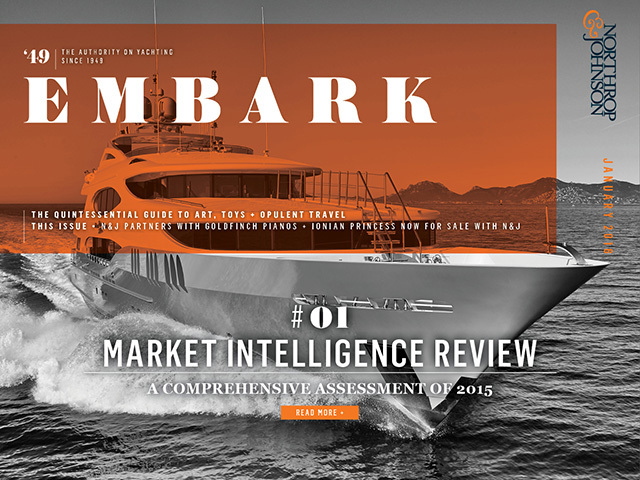 We’re kicking things off with a look back at 2015 and how the market fared. You’ll have to download our 2015 Market Intelligence Report for the full story, but the cliff notes tell us that 2015 was quite a success. The predictions for 2016 are brimming with confidence of an even stronger year ahead. And as far as New Year’s resolutions go, at Northrop & Johnson we’re looking forward to listing new central agencies for sales and charter, beating our sales record from 2015, keeping our charter yachts extremely busy throughout the year, bringing on new clients and continuing to keep our promises of integrity and dedication to excellence. We wish you all a happy, healthy and successful 2016 and we hope to see you on the docks somewhere this year. Northrop & Johnson logo marks are registered trademarks. While all due care has been taken to ensure the accuracy and validity of all the information published here, no responsibility will be taken in the event of facts, dates, times, or prices quoted being amended after publication date. No part of this publication may be reproduced or use in any form without written permission from Northrop & Johnson. *All rates quoted do not include expenses. © Northrop & Johnson. All rights reserved.